The Hotel Restaurant Etoile of Charmey offers eight rooms and two family suites with an authentic wood-paneled ambiance that mixes comfort, tradition and modernity. The rooms can accommodate from one to three people. Some rooms offers a view on the Fribourg Alps. The Hotel Restaurant Etoile of Charmey has also two restaurants. There is a bistro-style place that proposes Cheese specialties and typical dishes from the Gruyere district. Nova is a gourmet restaurant recognized by the Michelin guide where you can enjoy a fine-dining experience. The wine list of the two restaurants includes both fine Swiss wines and known French wineries In their reviews, guests of the hotel indicate that they liked the nice cuisine and the kindness of the staff. 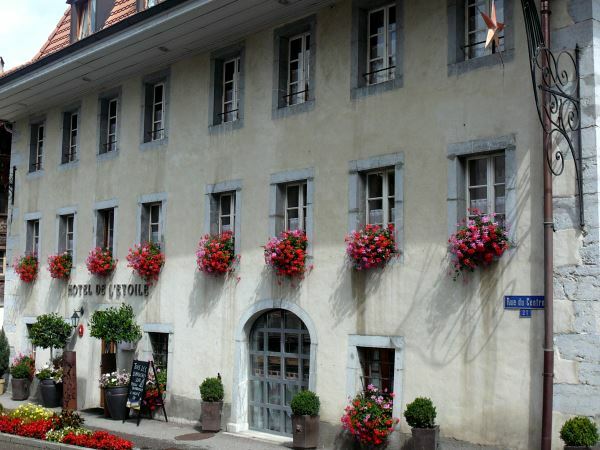 The relaxing Gruyere Thermal Baths of Charmey are just a two minute walk from the hotel. A wondefull hotel in the charming village of Charmey. Excellent restauran for those who fancy gourmet food and only one minute away from the baths!! !